Vermiculture biotechnology is vermicompost preparation from waste materials like leaves, dung, kitchen waste etc., by earthworms. The worms eat the waste material and their droppings are called as vermicompost, which is used as quality compost in the agriculture fields. 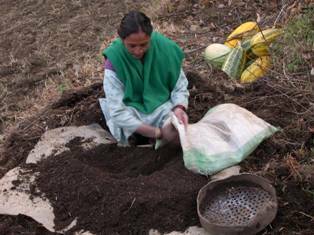 Vermicompost use in the fields is considered as way towards organic cultivation. HRG is training and demonstrating its preparation to the farmers in simplest way. 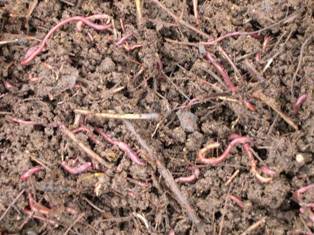 Eisenia foetida earthworm species is used for vermicompost preparation due to its adaptability to wider range of climatic conditions. Many parts in the Himachal Pradesh have restricted use of chemical fertilizers, it is very important that these areas should contribute for organic cultivation of vegetable and horticulture crops to provide chemical free produce to the consumers. This is how HRG has taken up this initiative on larger scale. More than 15000 people were trained in vermicompost preparation by HRG under different schemes. Organised group of around 160 women are regularly selling 2500-3000 Kg vermicompost @5/- Kg to HRG for nursery use and casing soil preparation . Agriculture with extensive usage of chemical fertilisers has made soil compact and calcareous. Level of carbon is very low and successive addition of the chemical fertilizers in such soils binds the nutrients and leave very low concentrations for the plants to absorb. In such a situation continuous use of quality vermicompost in the agriculture fields is helping in overall development of soil system. This is proved to some extent through the HRG studies in four crops Maize, Colocacia, Turmeric and Urad. Considerable increase in yield, significant increase in concentration of organic Carbon in soil was also observed after application of the vermicompost to these crops. The increase in the yield of different crops sown in the experimental plots in this initial study appears mainly through mobilization of the bound nutrients rather than nutrients available from the vermicompost. This was authenticated through soil analysis where Nitrogen and Potassium were observed in higher concentrations after addition of vermicompost. Vermicompost is a single solution to maintain the soil health and fertility and is quite popular in many parts of the country .